Myocardial infarction, Heart failure, Shenfuqiangxin, TGF-beta/Smads signaling pathway. Acute Myocardial Infarction (AMI) refers to ruptured coronary artery atherosclerotic plaques, which cause platelet aggregation, thrombosis and a decreased or interrupted coronary artery blood supply. As a consequence, serious myocardial ischemia and necrosis will happen [1,2]. Heart Failure (HF) is one of the major complications of AMI [3,4]. Due to the aging of the population and the improved survival rate of patients suffering from MI, prevalence of HF increases year by year. HF seriously affects the quality of life of patients. Although various treatment strategies have been developed for HF, the treatment effects of HF are still not satisfactory. Shenfuqiangxin capsule is a Chinese medicine preparation containing monkshood, ginseng, astragalus mongholicus, polygonatum, radix ophiopogonis, rhizoma chuanxiong, radix salviae miltiorrhizae, tinglizi and prepared radix glycyrrhizae and has functions of tonifying Yin and Yang, promoting coronary circulation and promoting diuresis and detumescence. Monkshood, ginseng and astragalus mongholicus warm Yang and supplement Qi and are monarch drugs. Combination of these three drugs can nourish vitality and active main organs to alleviate disease conditions. Polygonatum nourishes Yin and heart, radix ophiopogoni nourishes Yin, promotes saliva and relieves pain. Combination of these two drugs can sour and sweet Yin. Rizoma chuanxiong and radix salviae miltiorrhizae can activate blood to remove stasis while tinglizi can strengthen heart and diuresis and are assistant drugs. Prepared radix glycyrrhizae can strengthen heart to restore the pulse and is a guide drug . Thus, the combination of these drugs can nourish Yin and Yang. Ventricular remodeling is the main pathophysiological basis for the occurrence and development of HF. TGF-beta/Smads signaling pathway plays an important role in the development of myocardial remodeling . At present, effects of shenfuqiangxin on the expression of molecules related to TGF-beta/Smads signaling pathway in cardiac tissue of rats with HF post MI still haven’t been well studied. In this study, animal experiments were carried out to investigate the effects of shenfuqiangxin on HF. Monkshood, ginseng, astragalus mongholicus, polygonatum, radix ophiopogonis, rhizoma chuanxiong, radix salviae miltiorrhizae, tinglizi and prepared radix glycyrrhizae were sliced and mixed with 6X volume of water and was boiled for 0.5 h. Residue was boiled again with 8X volume of water for 25 min. Finally, filtered solutions were combined and concentrated to make aqueous extract. A total of 45 Sprague-Dawley healthy male rats (230 ± 27 g), aged 45 d, were randomly divided into Sham group, HF group and Shenfuqiangxin group (n=15). HF model was reproduced with MI which was created by ligating the left anterior descending coronary artery according to the methods reported by Pfeffer . Rats were given penicillin (100,000 U/d) for 3 d. In sham group, coronary artery was not ligated. 2 w after operation, sham group and HF group rats were administrated with saline through intragastric administration for 8 w, while in shenfuqiangxin group, shenfuqiangxin (14 g/kg) was used. Cardiac function evaluation: Echocardiography using twodimensional ultrasound was performed at 2 w after surgery (before gavage) and repeated at 8 w post gavage to measure Left Ventricular End Systolic Volume (LVESD), Left Ventricular End Diastolic Volume (LVEDD), Left Ventricular Ejection Fraction (LVEF) and Fractional Shortening (FS). All parameters were measured and averaged values of 3 consecutive cardiac cycles were calculated. HE staining: At 8 w after intragastric administration, rats were sacrificed and hearts were collected. Myocardium samples were fixed in 10% neutral formaldehyde and then embedded in paraffin. Tissue sections were prepared and subjected to HE stained for morphological observation under an optical microscope. Myocardial fibrosis: At 8 w after intragastric administration, rats were sacrificed to harvest the hearts. Hearts were washed with saline and the left ventricle was fixed in 10% neutral formaldehyde and then embedded in paraffin. Tissue sections were prepared and stained with Masson’s trichrome. Then the results were observed under a microscope. mRNA expression of TGF-β1, Smad2, Smad3 and Smad7 in myocardial tissue: At 8 w after intragastric administration, rats were sacrificed to harvest the hearts and Real-time PCR was used to detect the mRNA expression of TGF-β1, Smad2, Smad3 and Smad7 in myocardial tissue. The products of PCR were subjected to 2% agarose gel electrophoresis, and data were quantitatively analysed by Image Tools gel analysis system, and relative expression level was normalized to GAPDH. See Table 1 for primers used in PCR. Table 1. Primer sequence of TGF-β1, Smad2, Smad3, Smad7 and GAPDH. Protein expression of TGF-β1, Smad2, Smad3 and Smad7 in myocardial tissue: At 8 w after intragastric administration, rats were sacrificed to harvest the hearts and protein expression of TGF-β1, Smad2, Smad3 and Smad7 in myocardial tissue was detected by Western blot. Absorbance analysis was carried out with Image tools image analysis system, and semiquantitative indexes were obtained. SPSS 21.0 statistical software was adopted for data processing. Comparisons on measurement data between groups were conducted using t-test. Comparisons of enumeration data were conducted using the analysis of variance or the rank sum test. P<0.05 means difference was statistically significant. Before intragastric administration, LVEDD and LVESD in Shenfuqiangxin group and HF group were both increased compared with Sham group, while EF and FS were decreased (P<0.05). At 8 w after intragastric administration, EF and FS in Shenfuqiangxin group were higher than those in HF group (P<0.05, Table 2). Table 2. Comparison of LVEDD, LVESD, EF and FS in each group. HE staining showed that in sham group, there were no degeneration, necrosis, atrophy or hypertrophy in the myocardium and there were no mesenchymal inflammatory cell infiltration or hyperplasia of fibrous tissue. Myocardial cells were homogeneously stained and had clear boundary with intact membrane, and cross striation was arranged evenly. In HF group, myocardial cell swollen was observed, and some of the myocardial fibers were broken and dissolved. Striations disappeared, and vacuolar degeneration of cytoplasm, the interstitial edema, fibrous hyperplasia and inflammatory cell infiltration were observed. Shenfuqiangxin group showed different degrees of myocardial cell swelling, slightly blurred cross striation and slight inflammatory cell infiltration. Pathological changes of myocardium in Shenfuqiangxin group were mild and similar to those of sham group (Figure 1). Figure 1: HE staining observation in each group. Myocardium was red, collagen fibers were blue and nuclei were black or blue in Masson trichrome staining. No obvious left ventricular fibrosis was observed in sham group. In HF group, there was patchy or small focal fibrosis in the left ventricle. Different degrees of focal necrosis or scattered fibrosis were found in shenfuqiangxin group and were similar to those of sham group (Figure 2). Figure 2: Masson staining observation in each group. 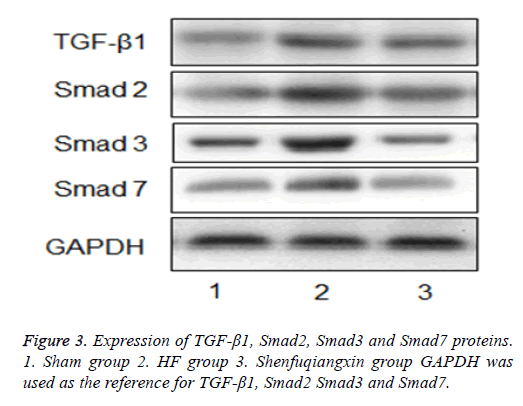 Comparison of the mRNA and protein expression of TGF-β 1, Smad2, Smad3 and Smad7 in each group The mRNA and protein expression levels of TGF-β1, Smad2, Smad3 and Smad7 were highest in HF group, followed by shenfuqiangxin group and sham group (P<0.05, Table 3 and Figure 3). Table 3. Comparison of the mRNA and protein expression of TGF-β1, Smad2, Smad3 and Smad7 in each group. Figure 3: Expression of TGF-?1, Smad2, Smad3 and Smad7 proteins. 1. Sham group 2. HF group 3. Shenfuqiangxin group GAPDH was used as the reference for TGF-?1, Smad2 Smad3 and Smad7. CHF is a very complex clinical syndrome and affected by many factors, such as neuroendocrine system, autonomic nervous system, cytokine and so on, which leads to myocardial structure, function and phenotype changes through a series of complex molecular and cellular mechanisms and finally results in ventricular remodeling . HF is an end stage of various cardiovascular diseases and is becoming an important public health problem in the field of cardiovascular diseases in china. There is no disease named “HF” in traditional Chinese medical science, however, according to clinical manifestations, this disease is related to "edema with the heart involved", "syndrome characterized by dyspnea "and "edema" category . In the theory of Chinese medicine, HF means sick in the five internal organs, imbalance between Yin and Yang and qi and blood blocking. In conclusion, the internal Qi and Yang deficiency is the main cause and the treatment should be based on invigorating Qi and warming Yang . Under the guidance of this rule, we adopted shenfuqiangxin capsule in the treatment of patients with CHF, and achieved satisfactory clinical effects. Shenfuqiangxin capsule is composed of monkshood, ginseng, astragalus mongholicus, polygonatum, radix ophiopogonis, rhizoma chuanxiong, radix salviae miltiorrhizae, tinglizi and prepared radix glycyrrhizae. From the modern pharmacological analysis , monkshood contains aconitine, isodelphinine, neoline, hignamine, uracil and other biological components. Monkshood decoction and water soluble part both had obvious cardiotonic effects on the hearts of frog, toad and warm blooded animals, no matter the hearts were normal or in the state of exhaustion. Tinglizi relieves asthma, promotes diuresis and makes Lung Qi clean. Polygonatum nourishes heart Yin. Previous study showed that  tinglizi has cardiac and diuretic effects and help to increase the output and reduce venous pressure in HF hearts. Alcohol extract of polygonatum can enhance immunity and polygonatum decoction has effects of expanding blood vessels, and inhibiting myocardial ischemia, hypertension, atherosclerosis and tumor. Effective components of polygonatum significantly improve cardiac function as well as heart rate and enhance myocardial contractility. All these drugs used together achieve a role of tonifying qi and warming yang. Clinical application of shenfuqiangxin capsule obviously improves the clinical symptoms of patients with HF. What’s more, in the case of ineffective using Western medicine, combined with shenfuqiangxin capsule has good curative effect and can reduce the dosage of Western medicine . However, the mechanism of shenfuqiangxin capsule in the treatment of HF is not clear. TGF-β signaling pathway can regulate the degradation of fibrous tissue and the deposition of extracellular matrix, so it is considered to be an important molecular pathway for the development of ventricular remodeling. In the early stage of MI injury repair, TGF-β serves as anti-inflammatory factor and can affect the synthesis and release of macrophages and endothelial cell chemotactic factor. In the late stage of MI injury repair, TGF-β/Smads signaling pathway promotes myocardial extracellular matrix deposition in the infarcted area and myocardium hypertrophy, fibrosis and left ventricular remodeling in the non-infarcted area. Among the patients with dilated cardiomyopathy, study of endomyocardial biopsy revealed a significant increase in myocardial collagen content in patients with severe HF, accompanied by a significantly increased mRNA expression of TGF-β1 in myocardium . Other studies showed that TGF- β1 promoted the proliferation and transformation of cardiac fibroblasts into myoblasts and produced extracellular matrix such as collagen fibrils and fibronectin . Smad7, a negative regulator of the TGF-β/Smads signaling pathway, inhibits TGF-β/Smads signaling pathway by interfering with the activation of the receptor activated Smads molecule (RSmads). However, in HF hearts, expression of inhibitory Smad7 is still unclear. Whether shenfuqiangxin improves myocardial fibrosis by increasing expression of inhibitory Smad7 molecules is one aspect of our study. In this study, a rat model of heart failure after Myocardial Infarction (MI) was established and treated with shenfuqiangxin. We found that 2 w after operation, LVEDD and LVESD in shenfuqiangxin group and HF group were both increased compared with Sham group, while EF and FS were decreased. The mRNA and protein expression levels of TGF- β1, Smad2, Smad3 and Smad7 in myocardium were higher than those in sham group, which was in line with the changes in myocardial tissue of rats with HF after MI. 8 w after intragastric administration, EF and FS in Shenfuqiangxin group were higher than those in HF group, indicating that shenfuqiangxin can effectively improve the heart function in rats with HF after MI. Moreover, compared with HF group, Shenfuqiangxin group could reduce the deposition of collagen fibers in rat hearts and inhibit the protein expression of TGF- β1, Smad2, Smad3 and Smad7. In conclusion, shenfuqiangxin could inhibit the expression of factors related to TGF-β/Smads signaling pathway in rats with HF post MI, which may be one of the most important mechanisms of shenfuqiangxin in improving myocardial fibrosis. Sen T, Astarcioglu MA, Beton O. Which coronary lesions are more prone to cause acute myocardialinfarction? Arquivos Brasileiros De Cardiologia 2017; 108: 149-153. Panayi G, Wieringa WG, Alfredsson J. Computed tomography coronary angiography in patients with acute myocardial infarction and normal invasive coronary angiography. BMC Cardiovasc Disord 2016; 16: 1-8. Frans VDW, Ardissino D, Betriu A. Management of acute myocardial infarction in patients presenting with ST-segment elevation. Revista Espaola De Cardiologia 2008; 62: 1-47. Keeley EC, Boura JA, Grines CL. Primary angioplasty vs. intravenous thrombolytic therapy for acute myocardial infarction: a quantitative review of 23 randomized trials. ACC Curr J Rev 2003; 12: 13-20. Wang L, Wang Z, Yuan L. Shenfuqiangxin capsule inhibits apoptosis through mitogen-activated protein kinase signal pathway in rats with cardio-renal syndrome induced by infrarenal aortic-clamping. J Trad Chinese Med 2017; 37: 80-87. Min AK, Mi KHYS, Kim HS. Alpha-lipoic acid inhibits hepatic PAI-1 expression and fibrosis by inhibiting the TGF-beta signaling pathway. Biochem Biophys Res Commun 2010; 393: 536-541. Pfeffer JM, Pfeffer MA, Fletcher PJ. Progressive ventricular remodeling in rat with myocardial infarction. Am J Physiol 1991; 260: 1406-1414. Liu X, Meng H, Chao J. Differential microRNA Expression and Regulation in the Rat Model of Post-Infarction Heart Failure. Plos One 2016; 11: 0160920. Clark WR, Paganini E, Weinstein D. Extracorporeal ultrafiltration for acute exacerbations of chronic heart failure: report from the acute dialysis quality initiative. Int J Artificial Organs 2005; 28: 466-476. Jian Y, Engle VF, He Y. Study designs of randomized controlled trials not based on Chinese medicine theory are improper. Chinese Med 2009; 4: 3-9. Fu M, Wu M, Wang JF. Disruption of the intracellular Ca2+ homeostasis in the cardiac excitation-contraction coupling is a crucial mechanism of arrhythmic toxicity in aconitine-induced cardiomyocytes. Biochem Biophys Res Commun 2007; 354: 929-936. De SG, Devereux RB, Roman MJ. Does cardiovascular phenotype explain the association between diabetes and incident heart failure? The strong heart study. Nutr Metabol Cardiovasc Dis 2013; 23: 285-291. Jing Y, Yu L, Liu HC. Autologous hematopoietic stem cell transplantation for treatment of 43 patients with acute lymphocytic leukemia: an analysis of the long-term curative effect. J Clin Rehab Tissue Eng Res 2007; 11: 9386-9389. Hein S, Arnon E, Kotin S. Progression from compensated hypertrophy to failure in the pressure-overloaded human heart.Structural deterioration and compensatory mechanisms. Circulation 2003; 107: 984-991. Xin YI, Xiaoyan LI, Zhou Y. Hepatocyte growth factor regulates the TGF-ß1-induced proliferation, differentiation and secretory function of cardiac fibroblasts. Int J Mol Med 2014; 34: 38-90.